It has been a good while since we’ve sent one of these communiqués. It’s not that we don’t love you; it’s just that we haven’t had much news. In this letter you’ll get an update on the Proximity Hotel and her restaurant. You’ll also learn about some special holiday happenings and about the lengths to which our team will go to ensure that you enjoy your visit. Some of these selfless folk endured a week in Napa and Sonoma to learn more about wine and food! Even though the construction of the hotel is coming along nicely, we’re still not sure of the opening date (but we think it will be by August ‘07). We’ll start building the restaurant soon. It will be separated from the hotel tower by a 32 (our lucky number!) foot wide garden. The restaurant will be long and narrow so that all of the guests will be seated less than 16 feet from large windows that overlook either the “Bluebell” garden that is near the hotel or a two-acre natural area that includes a small stream. Part of the restaurant will have a second floor that will house the Weaver Room. This wonderful event space will have windows on three sides (not unlike the Pavilion at the O.Henry) and an outdoor terrace. It will seat up to 150 guests for a dinner or luncheon. There will be another event room in the hotel tower, the Revolution Room. This room will seat up to 120 and will have huge windows on two walls and an adjacent outdoor terrace. You’ll notice that we’ve continued to honor Greensboro’s textile history (and present) with these names. It is only fitting that a hotel be named for Proximity Mill (the successor company, International Textile Group, still resides in Greensboro and its headquarters are adjacent to the hotel). The Bluebell Garden is named to honor the historic Greensboro clothing company still headquartered here and now called VF! So, what to name the restaurant? We’ve had a lot of fun with this. Thanks for the help. We received more than 800 suggestions when we asked for ideas in our last newsletter! How about: Bleu Denim Bistro? We like it because it gives confidence that the food will be good and authentic with the Bistro handle, and Bleu Denim implies a casual sturdy image. And, the fact that Proximity Mills was the world’s largest producer of denim doesn’t hurt. Why build it so close to the O.Henry? We feel good about the future of Greensboro and this neighborhood, and on the practical side, we can share some amenity services like our London Cab airport livery service. Plus, it is a lovely parcel of earth on which to plant a hotel. How will it be different from the O.Henry? Like the O.Henry, the Proximity’s design will honor a long favored architectural style, but the Proximity will employ a style most often used for post war industrial buildings, not hotels, giving it a “loft like” feel that is wonderful and rare. So, the “bones” will be different, but the warm and gracious interiors that are hallmarks of great hotels will be present. Thanksgiving & Christmas Dining: While Lucky 32 won’t be open, you can bring your clan to Green Valley Grill. It will open at 2 p.m. on both Thanksgiving and Christmas Days. To make your reservation, please contact Green Valley Grill at 336-854-2015 or visit greenvalleygrill.com. Gift Certificates: You can order Quaintance-Weaver gift certificates that can be used at any of our businesses by going to qwrh.com or calling our Gift Certificate Hotline at 336-370-0966. We’ll take your credit card number and mail them to you (or to the recipient) promptly. Group Gatherings: At each Lucky 32, you can order from our full menu in our private and semi-private dining areas. Plus, we offer reservations, call-ahead seating and a pre-ordering service that expedites service for larger parties. In Cary our elegant semi-private dining room seats up to 50. Our Greensboro Lucky’s private dining room seats 8-10, and in Winston-Salem up to 40 guests can enjoy semi-private dining. Call one of our Lucky’s for more information or to make reservations, and visit lucky32.com for our full menus. At the O.Henry Hotel, you can entertain an intimate gathering of 15 or a big bash of 150 (or something in between). See photographs of the party spaces and check out the menus at ohenryhotel.com, or call our events team at 336-544-9604. Get Lucky & Go to a Party! Too busy to prepare that perfect “covered dish”? Let Lucky 32 cook for you. You call, we cook, and we bring your order right to your car. In addition to our current menu, we have larger “party” size portions of some of the favorites and “Family Dinner” options. The “One Stop Wines” are priced low. For complete Get Lucky & Go menus visit lucky32.com. It’s perfect for office lunches too! Holiday Tea at O.Henry Hotel: The story of The Nutcracker will enchant all ages as we combine traditions of the holiday season with afternoon tea on two Sundays, December 10 and 17, from 2 p.m. to 4 p.m. Dreams of dancing sugar plum fairies, toy soldiers and waltzing flowers inspired the special treats that will accompany your choice of tea, warm apple cider or hot chocolate. Afterwards each child can decorate an ornament and help our chefs make gingerbread houses, all accompanied by music and costumed characters. Then join Clara by the tree as she reads the story of The Nutcracker. Bring your camera to capture this magical holiday event. Cost is $35 for adults and children. Call Green Valley Grill at 336-854-2015 for reservations. New Years Day Menu: Make sure that 2007 will be your luckiest year ever and join us at Lucky 32 for New Year’s Day. We’ll feature our full menu plus some special selections. According to folklore, eating greens on New Year’s Day brings paper money, black-eyed peas bring coins, and pork brings good health. Our Wine Director Julia Schiavone recently passed the challenging Court of Master Sommeliers Advanced Exam, making her eligible to sit for the full Master Sommelier exam. She hopes to be awarded a scholarship to take the exam in London in 2007. There are currently only 72 Master Sommeliers in the entire United States! The Sommelier competition includes a written exam in theory (including wine production, laws, viticulture, spirits, beers, and even cigars) a service performance exam and a timed double blind tasting. Julia also won the Young Sommelier Competition for the South Central Region of Chaîne des Rôtisseurs earlier in the year. This is quite a feat for the wine director of a small outfit such as this. Cheers! Happy Eighth: The O.Henry Hotel celebrates her eighth birthday this fall. We celebrated by sprucing her up a tad. During the past year, the guestrooms got new chairs, marble window sills and the TLC (Tender Loving Care) of painting, wallpaper and touch-ups that you’d expect. the honeyed-pine paneling. We like it more than we imagined! We hope you’ll enjoy this witty and touching prose while you linger over tea in the afternoon or cocktails in the evening. Best Rate & More: Please visit ohenryhotel.com to get our “Best Rate” for any day and save up to $70 on many weekends and holidays. We promise that you’ll always get our Best Rate if you book at our web site. In addition to our Best Rate, receive a $30 Amenity Voucher with a weekend stay (Friday, Saturday or Sunday night) beginning November 15 until December 15 or any day from December 15 until January 7 with every room booked online at ohenryhotel.com. Or, get a great deal with one of our packages below. Holiday Shopping: Run away from home for a bit of shopping and pampering. Just across the street, shop at more than 100 stores at Friendly Shopping Center and The Shops at Friendly Center! Our Holiday Shopping Package includes one night’s stay, a $30 gift certificate for Green Valley Grill, a $50 gift certificate for shopping at Friendly Center (with transportation to and from), and a full hot breakfast buffet for $269 plus tax. Please call Ana Abella, our reservations manager, at 336-544-9603 for package reservations. See a Show: Greensboro’s own Triad Stage is expanding its season. Our That’s the Ticket Package includes a wonderful night of professional theatre in one of the “Best Regional Theatres in America.” This package includes one night’s gracious accommodations, two tickets to a Triad Stage performance, transportation to and from Triad Stage, a full, hot buffet breakfast, and a late check out, all for $239 plus tax. Upcoming productions include Beautiful Star: An Appalachian Nativity (December 3-23) and Noises Off (January 21-February 11). It is tough work, but someone’s got to do it. How can we progress if we don’t “sharpen the saw”? We can’t. So, given our commitment to improve our “flavors” and our wine program, we convinced ten key members of this team to expand their “frame of reference” by spending a week in the tasting rooms and restaurants of Napa and Sonoma. This trip was like visiting family because the wine and restaurant world ends up being a pretty small one. Given that familiarity, the team ended up getting a lot of hands-on experience and “behind the scenes” time with the winemakers. One of the favorites of the trip was “sneak preview” tastings directly from barrels at a slew of the wineries (Twomey, Buena Vista, Louis Martini, Valley of the Moon, Kenwood, and Bouchaine). For an “insiders” tip, ask Bart, Chad, Jim, Julia, Karen, Leigh, Martin, Patrick, Sherrill or Will which ‘04 and ‘05 wines have the most promise. 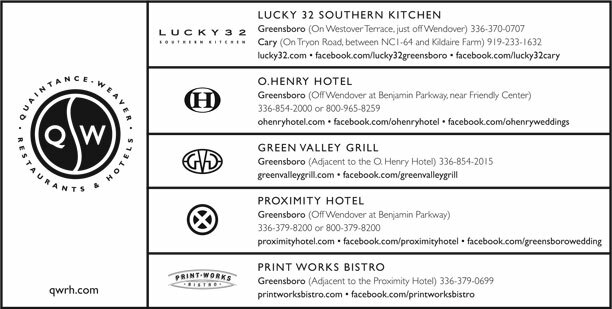 On October 29, we closed our Lucky 32 restaurant in North Raleigh. The reason is simple; fewer guests were dining there. Digging around we learned that people still really liked that restaurant, but there were a whole lot more options. Our neighbors were still dining there, but less often. It certainly wasn’t a happy day, nor was it sad. With the shifting sands of supply and demand, healthy restaurant outfits open and close restaurants all of the time. Twelve years is a life span far beyond the norm. Our Cary restaurant, just 16 miles away, is going strong. We send our sincere appreciation to the more than 2,600,000 guests that dined with us over the years. Heat olive oil in saucepan over medium heat. Add yellow onions and leeks and cook until soft. Add garlic and cook an additional 2 minutes. Add corn syrup, cider vinegar, and dried cranberries. Bring to a boil and reduce to a simmer. Make slurry with cornstarch and water. Add remaining ingredients except cornstarch slurry, and stir well to blend. Bring to a simmer and add cornstarch slurry, stirring constantly. Simmer for one minute more. All our recipes were originally designed for a much larger batch size. Please adjust to your taste and portion size. We reserve a limited number of tables so that everyone can be accommodated in a reasonable amount of time. Just give a call and make a lunch or dinner reservation. You can also make online reservations for Green Valley Grill at greenvalleygrill.com. You call, we cook, then we bring your order right to your car. Let us cook for your picnic, in office lunch, or a dinner at home with the family with the “Family Dinner” options. Don’t forget our “One Stop Wines” that are priced low. For complete Get Lucky & Go menus visit lucky32.com or just give us a call.